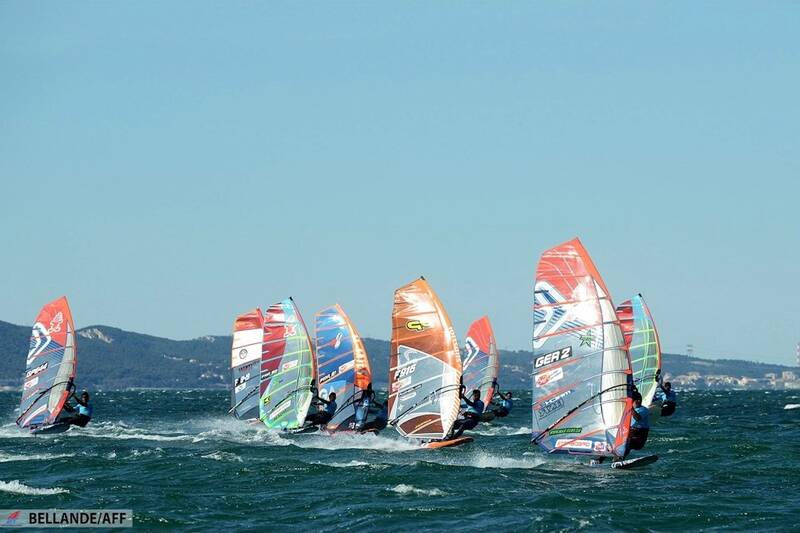 For 2019 the PWA Slalom World Tour will see a brand new addition to the calendar with the Marignane PWA World Cup set to raise the curtains on the 2019 racing circuit between 17th-22nd April. This isn't the first time that the PWA has visited the Mediterranean region of France, but it marks a welcome return of World Cup events to the French Mediterranean as the last time a full contest was held around these parts was just over two decades ago. France has been the dominant figure on the racing circuit in recent years - and last year French talents Antoine Albeau (JP / NeilPryde) and Delphine Cousin Questel (Starboard / S2Maui) finished the year as World Champions - so it seems fitting that the highly talented French squad will have the chance to battle it out in front of a home crowd! Marignane itself is located approximately 11.4 miles northwest of Marseille and is renowned not only in the windsurfing world, but also the sailing world and Marseille will host the 2024 Olympic Games nautical disciplines. Event Organiser and President of Club Nautique Marignanais - Delphine Bijvoet-Bremond, on bringing the PWA World Tour to Marignane: “It’s a dream come true! Marignane is located at the heart of a windy wonderland between Marseille, the second-largest city of France, and Aix-en-Provence, a place well-known for its colourful markets and delicious French delicacies. For 50 years already the Club Nautique Marignanais has been promoting windsurfing by training athletes and fans on the biggest saltwater lagoon in Europe: the Etang de Berre. However, one thing was still missing. Indeed, hosting a world event would show the sailing community the best attributes of one of the biggest metropoles of France. With the PWA Windsurf World Cup, this dream becomes true and we are honoured to host the first Men’s and Women’s Slalom event on the French Mediterranean coast for many years. Our biggest partner is the Metropole Aix Marseille Provence, who is promoting the economic development of 92 communes within our beautiful territory. The Metropole is home to a remarkable collection of historic remains, natural gems and Provence’s traditions. Along the turquoise waters of the Mediterranean, the rocky creeks (Calanques) offer a large variety of captivating landscapes with the sea and its sandy beaches, the Sainte-Victoire mountain with its pretty colours, but also the beautiful cities of Marseille and Aix-en-Provence with its important architectural wealth. However, not only does the region offer beautiful views, it is also the stage of an undeniable economic activity. The Marseille-Provence airport serves as an international hub in the south of France alongside the container and oil commerce which raises the port of Marseille-Fos to being the largest French port in the national rank. Moreover, Airbus Helicopters remains at the cutting edge of technology when it comes to the aircraft industry and thus makes Marignane home to the world’s leading helicopter manufacturer. On the other hand, the Metropole is also a major cultural centre. Artists and authors like Paul Cézanne and Marcel Pagnol have, time after time, made the latter their muse. Yet, above all, the region is a true windsurf paradise with multiple spots. Marseille’s world class conditions and infrastructure, for both sailing and windsurfing, have also been further endorsed by the fact that in 2024 the city will host the nautical disciplines for the Olympic Games. So, whether you are looking for slalom, freestyle or waves - sometimes up to mast-high at Carro when the south-east kicks in - Marseille has something to offer everyone. And last but not least: the legendary "Jaï" in Marignane, feared by some, respected by all. When it's Mistral time, we call it THE slalomers' place to be - 20 to 40 knots of wind in choppy conditions means that each individual is pushed to his or her limits. Sailors love to come here because they know that Le Jaï stands for guaranteed adrenaline. Not Convinced? There is only one way to find out... Come and try it out for yourself at the 2019 Marignane Slalom PWA World Cup." 25-time world champion Antoine Albeau: “I am super happy to have an event in France, Marignane is a super location because the wind can blow really strong, the event is on the lake just where the Mistral is landing from the mountains, we can have lots of different kind of wind. For the press it is also super good because the windsurfing in France and especially in the south of France is big and we need this kind of event to promote windsurfing. I am really looking forward for this event. See you there. A2." Thanks to Marignane’s diverse range of conditions, the first stop on the 2019 PWA Slalom World Tour promises to be a hugely exciting affair with the world’s best racers needing to be prepared for whatever Marignane may throw at them. Make sure you don’t miss any of the racing by tuning into www.pwaworldtour.com between 17th-22nd April.